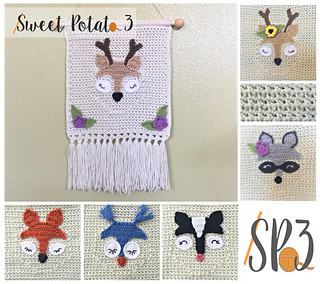 The Forest Friends Wall Hanging is a very cute, whimsical,fun and quick project that you can add to any home decor. The wall hanging makes a cute accent piece for nurseries, children’s bedroom, classrooms, reading nooks or even cabins. The finished size of the Forest Friends Wall Hanging is about 14-15” wide by 18” long counting the fringe but not the top hanger string. Customize the Forest Friends animal in any of the 5 animal appliques. Supplies will include a 15” long rod that has about a 1/2” circumference or round size you prefer, about 300 yards of the main background color yarn and of course use up that scrap yarn laying around for the animal faces. The faces are designed to accent the main detail in the upper face of the animals especially the eyes and ears. 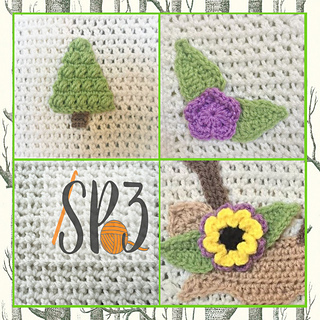 Add other fun applique pieces to make it fit your decor, the pattern includes a large flower, small flower, leaf and even a tree pattern you can use. This listing is for just the Forest Friends Wall Hanging. 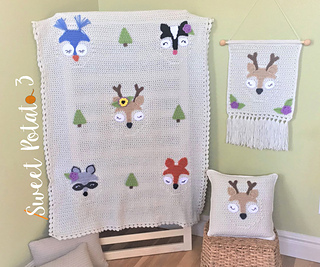 You may also purchase the entire Forest Friends Set that also includes a blanket and a pillow that will coordinate with the wall hanging. Click on the “Forest Friends Set” under the title of this listing. The Forest Friends Pillow is written in U.S. terms only. Do not use images without written consent from Sweet Potato 3.